One of Oregon’s economic strengths is the fact that in good times and in bad, people want to live in the state and move here. In particular, the state is able to attract working age, generally educated, individuals and households which increases both the size of the workforce and, in theory, the quality of the workers as well. With an ample supply of skilled labor, Oregon is also an attractive location for firms. The concern is that in recent years, Oregon’s labor force as fallen . Not just the labor force participation rate like elsewhere across the country , but the actual number of Oregonians with a job or looking for work. With fewer individuals in the labor market, this potentially reduces longer run growth, hurting the state’s economy. Is this trend likely to persist or will it improve? The good news is it will likely improve and turn around in 2014 and/or 2015. As job opportunities continue to improve, more Oregonians will be drawn into the labor market. The growth rate differential between job growth and labor force growth today is as bad as it has ever been, with a gap of approximately four percentage points. 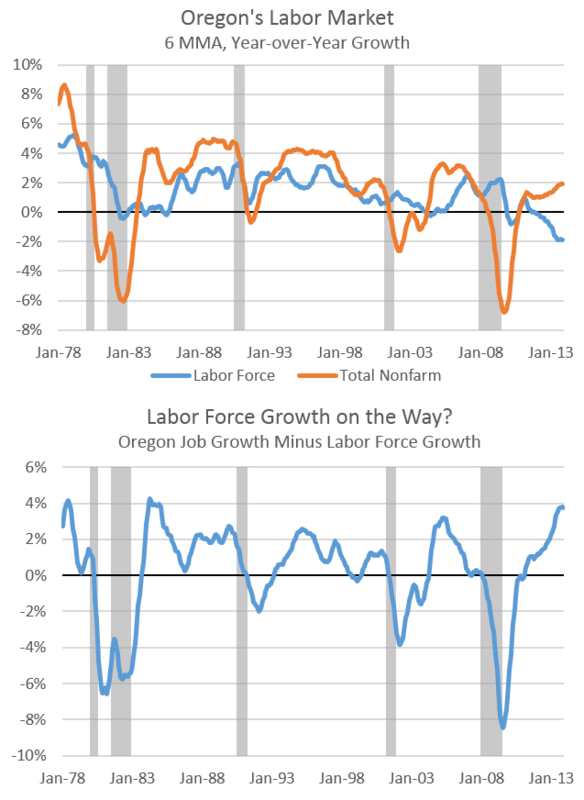 Job growth has historically led labor force growth in Oregon, with a one or two year lead time. This general pattern  was seen following both the severe early 1980s recession in the state and following the dotcom recession in the early 2000s. Today, the state is one year into this improved job growth rate, and the unemployment rate is only about a percentage point higher than normal. As such, expectations are for the labor force to stop declining in the near future, as the economic expansion continues, and workers become harder to find leading to wage gains. The labor force will begin growing again by the end of 2014 or early 2015, based on these historic relationships. Additional factors influencing the labor force are related to population growth, migration and demographics. Despite staying in the workforce longer than past generations, many aging Baby Boomers are retiring, thus pulling down the labor force. Millenials and young Oregonians, are aging into their prime working years, thus adding to the labor force. A continued influx of migrants should likewise boost the state’s labor force moving forward. Net migration plummeted by more than 30,000 migrants per year during the Great Recession, to a pace of approximately 7,000 per year in 2010 and 2011. In 2013, net migration into Oregon picked up to more than 22,000 migrants. This influx of households into the state is expected to strengthen as the economic recovery continues, further supporting labor force growth in the coming years. This post has been adapted from the March 2014 Quarterly Economic and Revenue Forecast document released on February 12, 2014. The full document is available on our office’s main website. Much of this decline is confined to the past year, for which the data is yet to be officially revised by the Bureau of Labor Statistics. Revisions will be released in March, 2014. While the revisions may be an improvement over the currently published data, they are unlikely to reveal outright labor force growth. The vast majority of which can be explained by demographics, as the Baby Boomers age into their retirement years, and young Oregonians attending school more. These trends explain approximately three-quarters, or more, of the labor force participation rate decline. In consultation with the University of Oregon, an impulse response function of employment and labor force growth finds that an increase in job growth corresponds with a rise in the labor force. Correspondingly a rise in the labor force, does result in stronger employment, however the relationship is not as strong and has a longer lag time.